In 1997 I moved my home and studio from the city of Edmonton to an acreage in Mulhurst Bay. This remove, in conjunction with preparations for an exhibition in Greece, and the recent death of my mother, brought about significant changes in my approach and practice. Up to this time I had considered myself to be exclusively an abstract painter. At first, I found myself in the process of “taking stock” of those painting issues and assumptions that had been a feature of earlier working periods and I began to re-examine some of them. 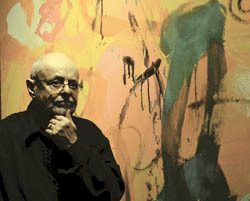 The September 2002 exhibition in Greece was entitled “Recollections” and was the first public acknowledgement of this process. I had begun to allow the things in my immediate environment that I habitually looked at with fondness, to have a greater presence in my paintings. The Purple Martin birdhouse in my yard is invariably the first thing I see as I look out of my bedroom window. This shape with it’s serrated edges, formed by the three tiers of platforms, that constitute the birdhouse, struck a visual chord for me and being similar, in my perception at least, to the serrated edges, of an architectural niche in a wall in Karnak in Luxor, which in ’89 had also had a powerful impact, began to be a starting point in the centre of each picture. It became for a while, a “given” and virtually all the paintings between 1998 and 2003 had this shape, usually in the centre, as a point of departure. During the 2002 Greek tour of museums and later in 2004, I made a few drawings of both landscapes and more particularly, antique ceramics. In 2002 a white Lekythos, in the collection of Charles Politis, held great resonance for me and I made a few impromptu sketches on the backs of envelopes. Some of these drawings subsequently led to and some were incorporated into, a painting based on this wonderful ceramic. I came to consider this painting a sort of double tribute. On the one hand, to the antique master ceramicist and painter and on the other, to Picasso, who I began to believe had stood before this very Lekythos, in admiration. So, some of my paintings, when derived from a very rich and resonant source, are a way of bringing in to my experience (much in the way that children “act out” scenarios and come to an understanding of “fixing” of situations), the essence of the subject. Later the painting process digests the literal and my personal abstract language takes over.